In case you don’t want to spend your time wading through the discussion, the letters, or the angst, I’ve attempted to summarize the most discussed pros and cons of each nickname on the ballot. I hope this helps someone, and what did I miss? UND’s nickname committee has submitted five finalists, from thousands of initial submissions, to President Kelley for consideration for UND’s new nickname. North Stars, Roughriders, and Sundogs have been fiercely debated around water coolers, in the forums, and across social media. Each stirs up strong passions, both for and against, and each were favorites to make the finals. Nodaks is in a class of its own–no one seems to love it, but it was often assumed to be likely to advance thanks to its strong regionality in playing on the state name (which was, itself, a contender until last night). Until last night’s cut, however, Fighting Hawks was a dark horse that was generally just discussed under the umbrella of “one of those hawk names”; no one seemed to have much to say for or against it, and there was certainly little passion around it. It’s not hard to see how Fighting Hawks made the cut, with its nod to history with “Fighting” and a fierce and strong animal in Hawks. With the three controversial contenders (North Stars, Roughriders, and Sundogs) having been bruised in months of debate, Fighting Hawks and its lack of baggage suddenly seems to be the safe choice. However, Fighting Hawks is also remarkably unoriginal. The post also noted that some variation on Hawks is used by 28 other 4-year schools, making it the 8th most popular sports team nickname. Fighting Hawks might well ride its lack of controversy to being the chosen name (for many of the same reasons 9 other schools chose it when migrating from Indian nicknames). It would probably be palatable by about as many constituents as any of the other names, but without the vitriolic opposition the more controversial contenders have. But, it would shift UND from having had an original, regional, and proud nickname that itself stirs emotions to a pretty generic nickname, chosen because it’s acceptable and teams need to have nicknames. It’s not particularly unique, and doesn’t particularly identify with the school or region. While it doesn’t stir up passionate opposition, it also lacks passionate support. Fans would throw their passionate support for UND behind the Fighting Hawks, but the nickname itself would raise little additional passion for UND. UND’s PWR outlook is a bit more interesting this week than last — a sweep probably leaves them at #2 (though #1 and #3 are each possible), a split most likely results in a modest fall (though staying at #2 is possible), getting swept would throw UND at the mercy of its competitors. In this idle weekend, #2 UND (PairWise Rankings) is most likely to keep its #2 ranking, but if they move it will probably be down to #3. That .7% chance of UND taking #1 is largely the likelihood of Alaska-Anchorage sweeping Minnesota State (KRACH gives Anchorage a ranking of 53.43 and Minnesota State a ranking of 613.98, thus predicting Alaska-Anchorage has an 8% chance of winning each game, or about a .6% chance of winning both). To see the threat of falling to #3, UND need only look at current #3 Boston University. UND currently wins the comparison 2-0, but on a razor thin .5856-.5845 RPI advantage. Even a single BU win (and a few other things going right) could be enough for BU to overtake UND. 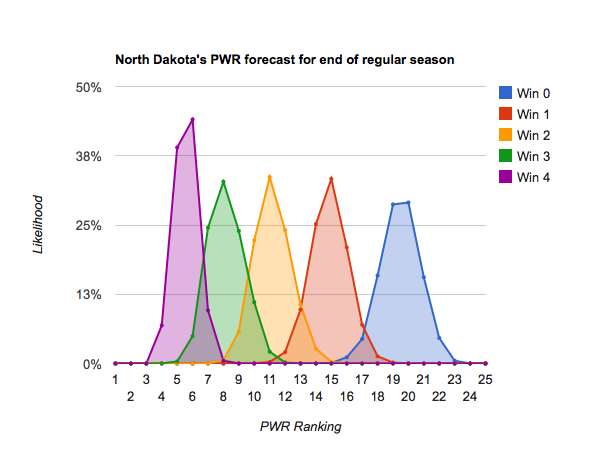 The regular season outlook has improved to the point that UND is nearly a lock for an at-large bid. Only an epic collapse (e.g. 2 or fewer wins in the final 8 games) combined with a disastrous conference tournament could knock UND out. Can UND take over #1 this weekend? 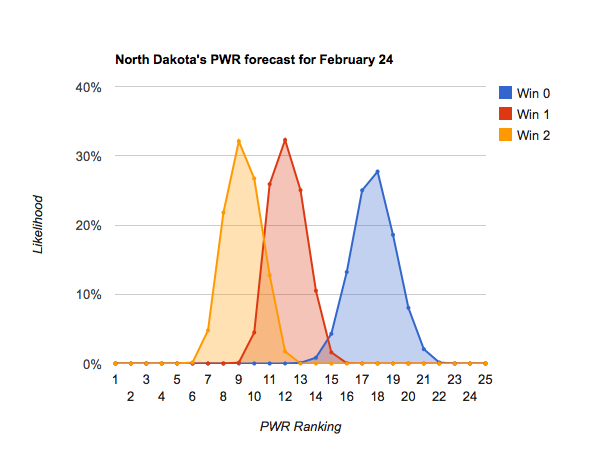 It’s a bit of a longshot, but if everything goes well for UND this weekend, they could climb to #1 in the PairWise Rankings. Incumbent Minnesota State controls it’s own destiny — a sweep guarantees they stay atop the heap for one more week. A split, however, opens the door for UND. 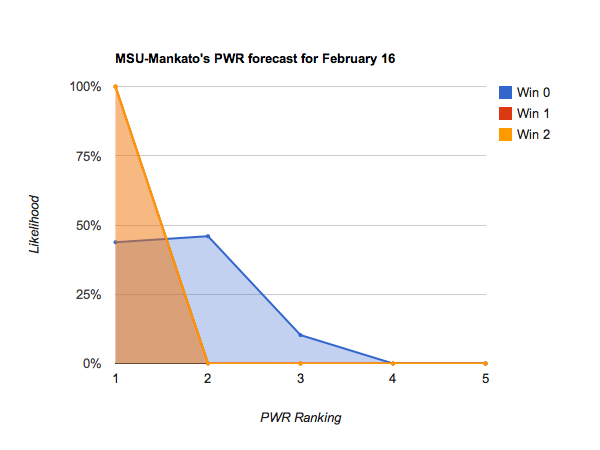 If UND sweeps, they can take #1 with a suitably bad performance by Mankato. 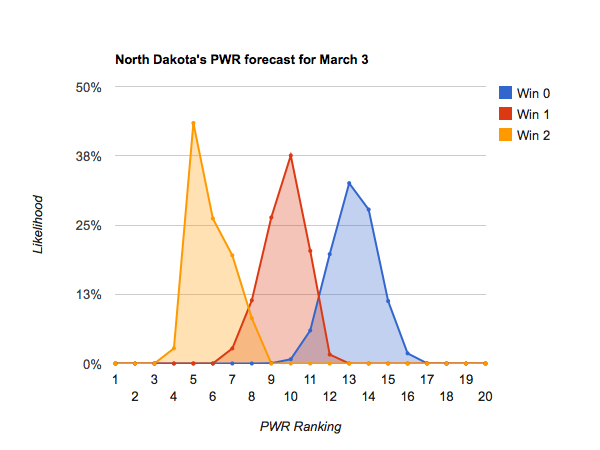 It’s remotely possible, though not likely, for North Dakota to take #1 even with a split. Finally, it’s remotely possible (about 2%) for Nebraska-Omaha to take the #1 spot this weekend (a scenario that would almost certainly require a sweep of UND), and extremely remotely possible (about .2%) for Boston University to take #1. 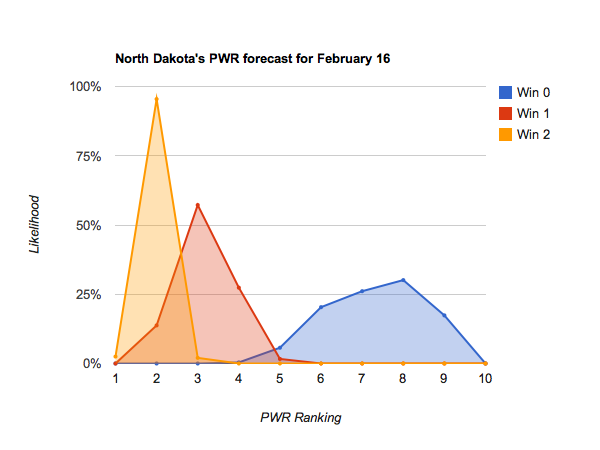 Author Jim DahlPosted on January 30, 2015 January 30, 2015 Categories Men's HockeyTags PWR, PWR forecast4 Comments on Can UND take over #1 this weekend? Here’s what UND fans want to happen to maximize UND’s chances of making the NCAA tournament. No math here, I promise. UND needs itself to do as well as possible. Anything short of one win makes an NCAA tournament bid pretty unlikely. Two wins gets UND an auto bid so none of the rest would matter. The more of these we get, the fewer of the following we need. My last full season prediction for UND, in February 25’s No surprises in UND’s PWR Outlook, suggested that UND needed 2 of its 4 remaining games to stay positioned for an at-large NCAA berth. 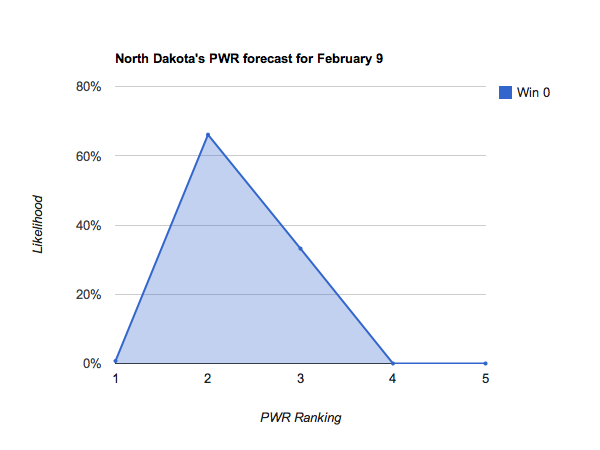 UND closed the season with two splits and landed at a PWR ranking of #10. 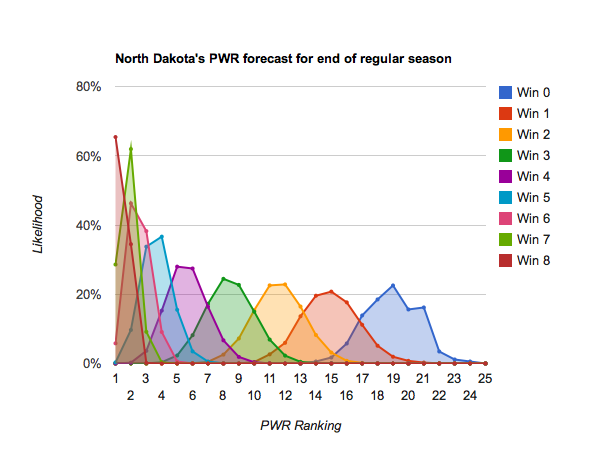 Because UND did just barely enough to stay above the bubble, it can’t rest on its laurels. Elimination this round (in either 2 or 3 games) would push UND back onto the bubble, most likely toward the bottom. That wouldn’t spell the end of UND’s season by any stretch: UND could get lucky and land in the upper #11-13 range based on other teams’ outcomes, or most conference tournaments could be won by higher ranked teams allowing #14 or even #15 in at-large, or unexpected future developments could raise UND’s PWR ranking even after UND has stopped playing. But, far safer would be for UND to come out of this weekend with two wins. That still wouldn’t quite assure UND an at-large bid (as low as #13 or #14 after two wins this weekend would be possible with some bad luck), but they would be on the inside hoping not to fall instead of on the outside hoping to rise. 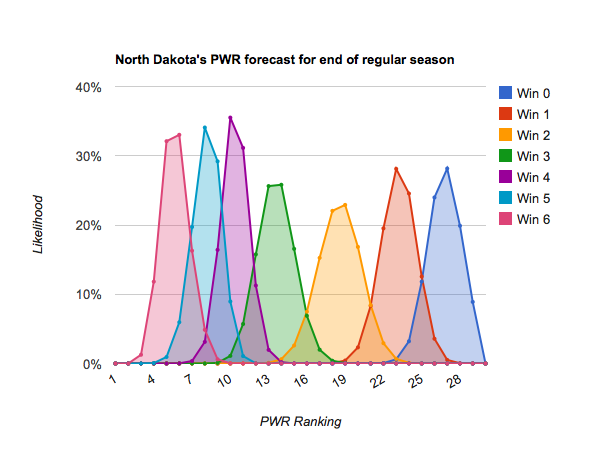 Three weeks ago in UND’s PWR outlook with 10 games to go, I predicted that UND needed to win 7 of its remaining 10 regular season games “to be in a comfortable position for an at large bid going into the conference tournaments”. UND proceeded to win 5 of its next 6 games, and has just 4 remaining in the regular season. The forecast remains remarkably consistent—UND now seems to need to win just 2 more games to go into the conference tournament in position for an at-large bid. Even just 1 more win would put UND on the bubble, with the conference tournament providing ample opportunity to rise off the bubble. #10 UND is positioned to stay about the same with a split, most likely climb to #5-#7 with a sweep, or fall to #12-#14 if swept. Note that coming out of the weekend at #4 is possible, though it would take a lot of help. The remaining season outlook is pretty much what you’d expect — last week’s, but with everything shifted by the two wins UND earned since then. UND now needs to win about half its remaining games to be in at-large position going into the conference tournament. 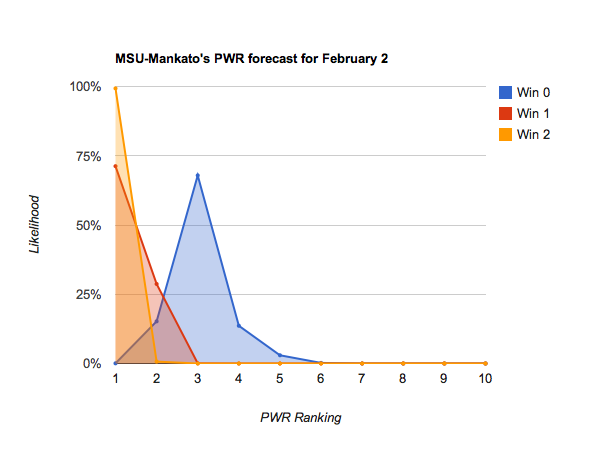 The uncertainty around the PWR formula has apparently been resolved, with USCHO adopting the CHN formula last weekend. (See PWR formula uncertainty resolved). 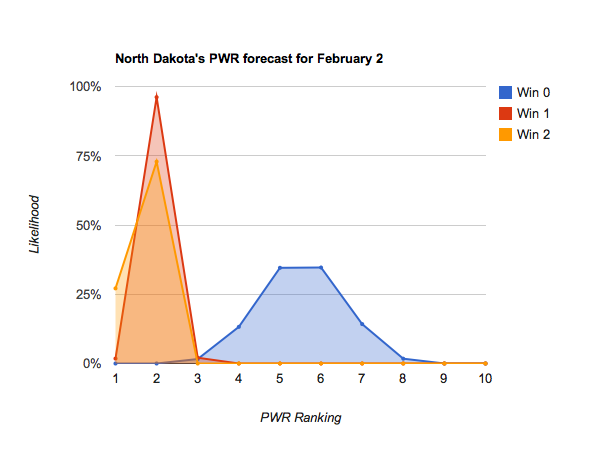 So, these forecasts now use the same formula as both USCHO and CHN.